Best Ab Roller Wheel Buyers Guide – More For Your Core! You are here: Home / Buyer's Guides / Best Ab Roller Wheel Buyers Guide – More For Your Core! 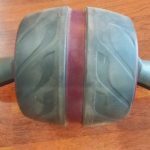 The objective of this post is to help you find the best ab roller wheel and show you how to use it effectively. As the title of my website indicates, my goal is to help people build stronger bodies. My belief is that building a strong core is crucial to having a strong body. Whether it is just doing everyday things around the house, or working out six hours every week, a strong core is vital. A strong core helps to protect your spine. One tool that I use is the ab roller wheel. I have used different models, and types over the years, so hopefully I can lend some valuable information as you search for a wheel that works best for you. 0.3 Ouch, what was that? 0.5 So, how do you use an ab roller wheel? 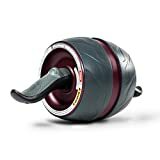 1 Best Ab Roller Wheel! A strong core has become excruciatingly undeniable to me as a result of my injury in late 2015. I have a long history of back problems and I never truly understood the value of a beefed up core. Please feel free to read my story here. It wasn’t really until I started working with my chiropractor, that I understood how vital a strong core is for me. I let my ego get the best of me and thought that I could do whatever I wanted, with complete disregard for my body. I was more impressed with how much I could deadlift, than with the detrimental effect it was having on my back. Now, I am not here to say that deadlifting is bad, it was just not something I should have been doing. Anyway, I blew a disc in my back and sprained my sacroiliac joint (pelvis area). The disc was pushing up against my spinal column and I was hunched over at about a 30-degree angle at my waist. I couldn’t straighten up and had a lot of trouble sleeping. I was stuck icing my SI joint for about 6 weeks, 5 times per day minimum. Finally, after about 5 months, I was able to get back in the gym and work on strengthening my core. This time it was way different though. I have been focusing on high reps and low weight, working to build my body up. I have replaced the higher weight low rep exercises and honestly, it’s really hard. I feel better than I have in a long, long time. Anyway, I tell you all of this, to kind of give you some background about me and what I am now doing to build up my core. I have really taken a liking to ab roller wheels, as they provide a great core workout. When you do these properly, you will feel it in your midsection. Now, I must warn you, there are some risks with using an ab roller wheel, and you should consult a doctor if you have back problems. It has taken me a while to get to the point that I can use one and use it effectively. When I was first coming off of my injury, no way. But as I have progressed and worked my core out in other ways, I am at the point now that I love using an ab roller wheel. So, how do you use an ab roller wheel? Well, it’s actually a really cool concept. First, you need an ab roller 🙂 One of the things I like about this exercise is that you can take it slow at first and build your way up. I would not recommend going all out when you start with one, back injury or not because you could hurt yourself. You can roll yourself out there little ways, to get the feel of it. As you get the hang of it and get stronger, you can extend yourself further out. You start on your knees, with your hands on the handles of the ab roller. You don’t want to let your back sag or arch. If you are familiar with cat-cow, a yoga pose, you really want to make sure when you start the ab roller, you are in more of the cat position, so your low back is not sagging. You want this to be all one smooth motion, using your abs and core to extend and pull yourself back in. It is easy to do these wrong and pull in with your arms or your legs, but you really want to concentrate on keeping your low back straight, not sagging, and pull yourself in with your abs. Check out this video for the right way to do them. So, let’s get right into this review. 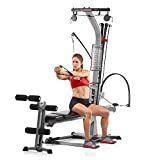 This is a unique ab trainer in the fact that it’s actually two wheels, one for each hand. Each handle is wrapped with a soft foam grip in the middle, and wheels on either end. It’s basically a dumbbell with wheels. This unique setting allows you to work your entire core and you really have to concentrate to make sure that you are keeping both sides of your body in sequence. The SKLZ Core Wheels is not only great for the core but also allows you to get a full upper body workout. You can move the wheels independently or in tandem with each other. You can do fly’s with these if you turn them to the side and use them for pushup variations. You can really engage a lot of muscle groups with these unique handles. You can use them to stretch yourself out, like in a child’s pose type of exercise. Or use a handle and go underneath your torso, for a great side stretch. You can also use them as pushup handles, and this will keep you somewhat off balance as you keep the handles right in front of you, and not let them roll. One thing I really like about these is you can use them on a variety of surfaces, hardwood, carpet, etc and just roll freely. These are non-slip ab roller wheels, so multiple surfaces are no problem. They are also lightweight and portable, which makes this model a top choice for the best ab roller wheel. Now this one is big and versatile. I am not sure where to begin here! You can use this as a traditional ab roller wheel, with its big fourteen-inch wheel. 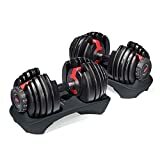 Weighing in at six pounds, this is definitely a heavy duty model, with extra features that other ab rollers do not offer. First of all the soft foam grips allow you to use this as you would a regular ab roller. The fourteen-inch tire has a ton of traction and can be used on a variety of surfaces, such as carpet, or hardwood floors. The thing that is unique about this Lifeline Power Wheel is that you can also attach this to your feet. The foot pedal provides a lot of versatility. You can do planks with this, or pushup, by attaching your feet and creating an environment that is off balance. Off balance means you have to work harder. So with a plank or a pushup, not only do you have to concentrate on keeping your core tight normally, but this added dimension throws you off even more (in a good and positive way). You can also do your own variation of the wheelbarrow races, all by yourself. Again with your feet attached to the wheel behind you, face down, you can walk yourself across the floor. This is a great upper body and core workout. I would recommend that this would be a more advanced move, so something to work up to if you are just starting out. 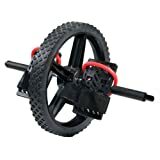 Given that, though, this wheel is great for beginners as well as more advanced workout fiends, and that is why it makes the list of my best ab roller wheel. Ab Carver Pro is a personal favorite of mine, I own this one. There are a lot of things I like about this ab roller. For starters, I really like the rubberized, ergonomically designed handles. There is actually a left and right-hand grip. It is really comfortable to grip and fits nicely in my hands. As you probably noticed, the Ab Carver Pro is designed differently from other ab rollers in that it has a really wide wheel. This wide design allows you to not only extend your upper body straight out in front of you, but you can also extend to the right or left side as well. This enables you to work more areas of your core. With large, stable rubber tires, and super wide wheel it works on multiple surfaces. The Ab Carver is also spring loaded, which adds some resistance to the workout. As you extend out, the spring is loaded and as you come back in, it springs back. This spring mechanism actually does help a little bit on the return, which actually allows you to extend farther and helps relieve some pressure on your lower back. I really like the stability of this ab roller, I never feel like I am going to tip over. The compound movement is another great aspect, you are engaging chest, back, arms and core. I would say this is a great tool to add to your workout routine to change things up. 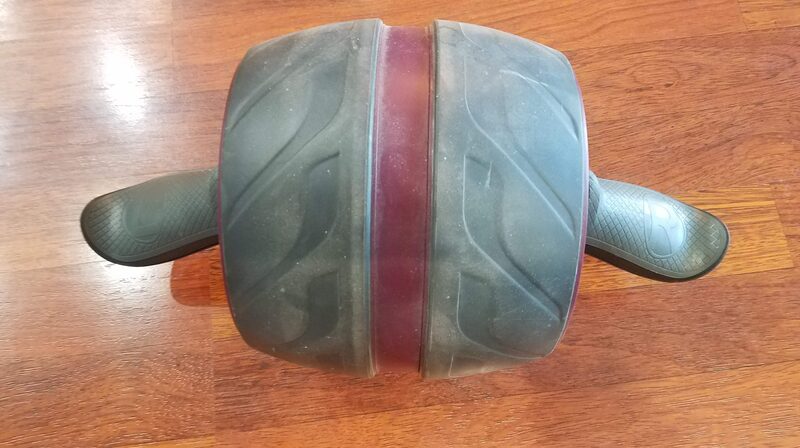 Based on my own personal experience, I have to say this is one of the best ab roller wheels I have used. Of course, that’s probably why I bought one. This heavy-duty, durable ab roller is a very versatile wheel. Very similar to the Lifeline product mentioned earlier, this wheel allows you to really change up your workouts. The 14-inch wheel provides traction, so you can use it on a variety of surfaces. The dual hand/foot grips enable you to work different muscle groups in different ways. With comfortable foam grips, and smooth rolling will allow you to experience a long range of motion. This ab roller wheel is great for athletes but also is good for anyone who is just trying to improve core strength for everyday life. If you are a newbie, I would recommend you start slow and work your way up to more advanced training. This wheel is great for different types of core exercises. As I mentioned before, you can be your own wheelbarrow by strapping your feet and basically dragging them behind you as you pull yourself around with your hands on the floor. For a little more off balance work, you can attach your feet to the foot pedal and use this as do a glute bridge exercise. Using the wheel with the glute bridge just adds a great element to the workout. You can also do knee tucks, with your feet on the wheel. Basically, assume the plank position (or top of a pushup) and keeping your hands on the ground in front of you, tuck your knees up to your belly, using the wheel. So, with your feet down on the pedals, tuck your knees to your belly. There are a lot of different exercises you can do with this ab roller wheel, so give it a try. This is a different type of ab roller, and it’s very interesting. It has two padded foam handles, with a gel grip, connected to a multi-directional ball in the middle. Like the ball on an old-school mouse. You are not limited to forward and backward movement with this ab roller. The center ball gives you the flexibility to move around in different directions, and on different surfaces with no problem. I would definitely say this is a more advanced type of ab roller. You certainly can use it to go straight out and straight back, and being a ball, you really have to focus on keeping yourself straight. The advantage of this roller over many of the other ones is the ability to move in multiple directions. You can move side to side, or do a figure eight if you want. The AbDominator enables you to work a full range of motion with your workouts. You engage not only the core but other muscle groups as well. This is really a unique ab roller that allows for a full range of motion, and multi-directional movements. You can do pushups, one hand on the ground, the other on the AbDominator, it’s basically a fly and a pushup in one motion. So again, there are a lot of different ways you can use this tool. This ab roller wheel is a new concept. The twin wheels add extra stability when you roll out farther and that same stability when you roll back in. I think it is easier to operate than an ab roller with a single wheel. The resistance band offers multiple levels of resistance as well. Depending on how you configure the band, there is more or less resistance. I think this product would really be great for someone who is just beginning, or sedentary people who want to work on more core strength. This unit comes with dual purpose knee pads. Obviously, the pads are there to help pad your knees from the hard floor. In addition, they have designed the knees pads with a woven bottom, so you can weave the exercise band in different positions that will result in more or less resistance. It’s really an interesting concept. Again, I think the dual wheels and the ability to adjust the resistance are both great features. 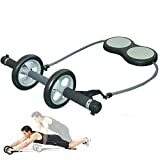 A lot of people will see benefits from this ab roller and I really think it’s a home run for those who are just starting out. I think the resistance bands will help out with folks who may find issues with lower back using other ab rollers. This one may not be as hard on the back. You can easily adjust the weight by just changing how to hook the support tube, even beginner can start training without trying hard. You can increase the strength naturally with four level weight adjusting. Twin roller supports your body stable, you should not hurt your wrist or lower back from breaking posture. Your knees fit on the knee pads gently and well, your training posture also will stabilize. You can enjoy tube training to exercise bicep, shoulder and pectoralis major muscle. Total training of the whole body can be done as you like. Okay, so this isn’t necessarily an ab roller wheel, per se, but it still fits into what we are talking about here. The AB Dolly Plus has been around for a long time. This is a very flexible and versatile way to work your core and other muscle groups. You can really work a full range of motion with the AB Dolly. You can use it as a traditional roller, where you would lean on the unit with your forearms, and your knees on the ground, working yourself out and back. Also use it to perform knee tucks, by having your hands on the ground in front of you, with elbows straight (not locked). Then work your knees in toward your belly. 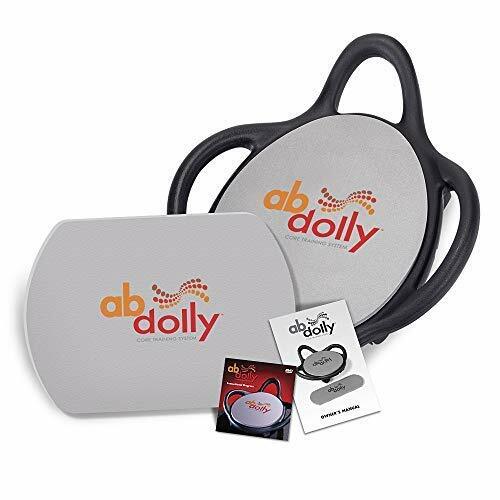 The AB Dolly Plus allows you to work so many different muscle groups. You will also love the range of motion. Given that it is a platform supported by four wheels (ah, okay, it does qualify under the title of my post…it has wheels) it provides an uneven experience. Now by uneven, I mean that in a good way, it will make your body work in different ways to keep it under control. Uneven workouts really add value to your typical routine. The platform itself is contoured to enable a wide variety of positions and exercises. You can use this to perform a glute bridge, which will engage the abs, glutes, hip flexors, hamstrings, a lot of the core muscles. So versatility is the name of the game with this one. Delivers great range of motion in any direction to target those hard to get areas. Flexibility and versatility are the the keys to any successful workout program and the ABDolly delivers! Another unique option when it comes to ab rollers. This is a set of two core coasters. Each coaster is designed with a triangular shape with three wheels attached to the bottom. The wheels are attached to each corner of the triangle. Each triangle coaster is about 10 3/4 inches. The wheels themselves are made of hard rubber and will slide smoothly on many surfaces. Again, this is going to be an uneven type of trainer, which is really good, but some people may not be there yet. The beauty of this setup is that you can use one coaster, or both of them at the same time. Using one coaster by itself gives you the flexibility to not only use it as a traditional ab roller, using the out and back method but also going multiple directions. Since it is on 3 wheels, you can go front, back, side to side, do figure eights, or just about any motion you want to explore. There is also the option to use the two coasters together, one in each hand. You can do flys on the floor, unbalanced pushups, roll back and forth using a wide or narrow grip. There are just a ton of options. You can face down on the ground and put your feet (toes) on the coasters and drag yourself around, giving your upper body a workout. 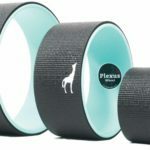 The Core Coaster also comes with an attachment for a resistance band, so you can add a little extra something to the workout if you so desire. Some people have complained that these will tip over. These are not easy to use, it’s a no joke workout. I don’t know if people are just not using them right, or if they don’t have the core strength to use them properly. Definitely takes some getting used to. 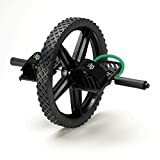 SCIENTIFICALLY PROVEN - Why would you buy an ab roller or exercise wheel when the Core Coaster has been scientifically proven by the University of Alabama to activate the obliques 435% more than a traditional crunch and 300% more than a pike. The Core Coaster is the most versatile core strength and stabilization exercise device! The Core Coaster combines the Ab Wheel, Sliders and Assistance / Resistance Training All in One Package! HANDS OR FEET - Ab Wheel / Roller with 360° Range of Motion. Strengthen your core and entire body! For any fitness level (1-4 levels). Limitless exercises! OUR GUARANTEE - We guarantee that you'll get the best workout or your money back! Portable, versatile, sturdy. Works on almost any surface - wood, synthetic wood, concrete, rubber gym mats, thin carpet, linoleum, astro-turf. The Core Coaster is patented. If you want to spend a little bit less and still get the benefits of the Core Caster, the single model may be a good choice for you. This unit has been re-designed with a larger platform. The Core Coaster has been increased from 8.5 inches to 10.75 inches for a more stable surface. There are ridges on the sides of the platform for proper finger placement. There are three hard rubber wheels attached to each corner of the triangle. Again, as with the previous review, the Core Coaster is a super versatile training piece. You can work your abs as you would with a traditional ab roller, by going rolling out and then back in. You can also add to this by going side to side, or really any direction you want. You can use this with a single arm and do some more extreme training, do pushups with one hand on the ground and the other on the coaster. There are so many different ways to use this tool. In f, ct the product comes with four levels of training exercises. They have come up with some very creative ways to use the Core Coaster. This is definitely something that takes time to get used to. I would not recommend using it on a tile floor, as the grout lines may restrict, or impede your movement. I think a hard, flat surface would really work best. Now here is a traditional ab roller wheel that everyone thinks of. These guys have been around for years and years. It is very basic but gets the job done. There are two wheels that are fused together, so that offers a little bit more stability than some of the less expensive models. The wheels are non-skid as well, so that works great on hard surfaces. You can also use this on carpet very easily. This ab roller is lightweight and easy to carry with you. The handles are designed for easy grip and no slip. Pushups – this would be close grip pushup motion, but requires added coordination and strength, so the wheel won’t move out from under you. Side roll out – you can work your obliques by kneeling down and working the out and back motion from a side seated position. A really advanced move is us the ab roller from a standing position. I definitely do not recommend this, but watching someone do it, is pretty cool. Anyway, this is a basic ab roller at a moderate price. Similar in some ways, yet also different than the other ab rollers on this list. This wheel gives you the ability to roll out and roll back in, as you would expect. The thing that I like about this particular roller is the three-inch wide wheel, which gives you more stability than the ones that are thin. Ergonomic, foam grip handles, are comfortable to use and the extra wide wheel has great traction, for use on multiple surfaces. You can use this on hard floors as well as carpet, which is always nice. It is important to use an ab roller the correct way, and this unit comes with a workout guide to help you perform this exercise the right way to help you avoid injury. 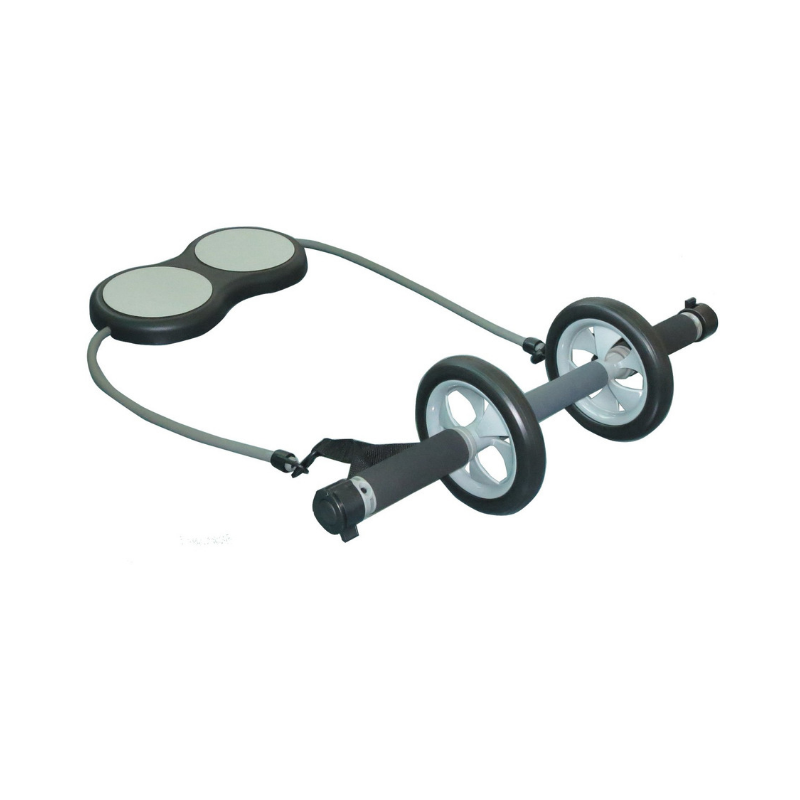 This ab roller also comes with a knee pad which is really helpful on hard surfaces. The handles are removable for easy storage or taking the roller with you while you travel. These are really nice to have as an option when you travel, making this one of the best ab roller wheels. Again, you want to make sure you are performing these exercises correctly, and when you do them right, you shouldn’t feel any pain in your lower back. If done properly, this type of workout can be more effective for your core and abs than situps or crunches. Everyone thinks of crunches as situps when you talk about abs and core. So this is an effective way to work those areas. I do like the stability this roller offers since it is wider than most of the other rollers out there. There are a lot of ab rollers on the market these days. They all promise something, great abs. While I agree that these ab roller wheels can really help with core strength, and specifically in the abdominal area, you have to put in the work, and eat appropriately to see results. An ab roller needs to be used correctly, to give you the best results possible. If you don’t use it properly, you can actually end up injuring yourself. I definitely recommend watching the how-to video at the beginning of this post for instruction on how to perform this exercise properly. If you have a lot of back pain, this may not be right for you. Also, if you have a really bad back, I would definitely check with your doctor before you buy one of these. That being said, these are a great training exercise and can help to alleviate some back pain by building up the muscles that support the spine. Start slow, and work your way up. 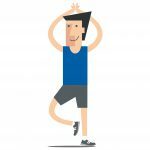 Even starting with short movements can help you to achieve the goals you want to achieve. If you are looking for a great core workout, I would encourage you to try an ab roller, if you haven’t tried one before. If you are a newbie, you may be really surprised by how intense the workout can be. If you are a pro, you probably already know the benefits that an ab roller can provide. 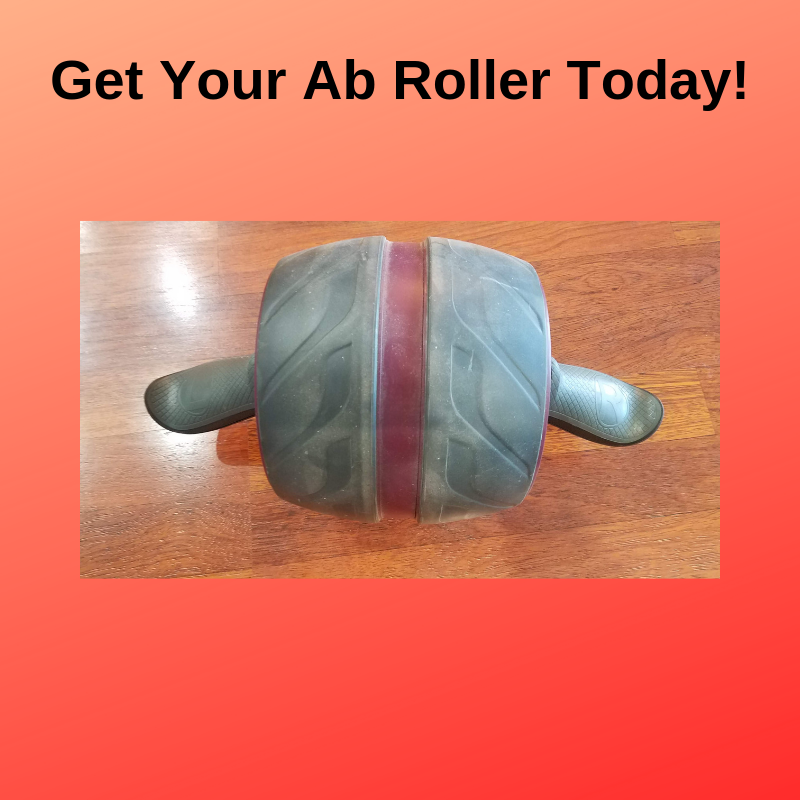 Pick up your ab roller today! As always, I appreciate you stopping by and reading my review. If you have any questions or comments, please reach out to me and I will do my best to get back to you as soon as possible. Which ab roller wheel is right for you? I have always like the ab roller wheel concept. I had one of the old school ones but I would love to try these newer styles. They are so diverse now! I have bursitis in my knees so I don’t think I can use them anymore but I want to get one for my husband. I like that they are so small and compact. Anyone, anywhere could use these without any special space or other equipment. That is certainly a huge plus. No massive, heavy awkward, space hogging equipment and they are also affordable for most everyone too! Since you are using your own body weight, most anyone of any size could use these also. The same piece of equipment could literally work for a whole family without extra add ones. You could even travel with these! I think I would want to try the SKLZ Core Wheels and the Perfect Fitness Ab Carver Pro. Thanks for this very detailed review! Thank you, Jessica for your input. Yes, if you have knee problems, you probably don’t want to do the standard roll out and back, but some of the other variations may work well. That is what I really like about some of these options, is the versatility. You don’t just have to kneel down and use the ab roller wheel for one motion, you can workout multiple muscle groups. I appreciate you stopping by, let me know if you need further explanation. Anyways, thanks for the post! I really enjoyed it! I am glad you like it and thank you for stopping by. Sounds like you might be ready for a new ab roller 🙂 Let me know if you have an questions. I did not realize there were so many types of ab rollers. I remember back in the 1980’s when my dad brought one home. At least I think that’s when it was. It was a great exercise back then and is still today but it’s amazing how many types there are now. What do you think the best one is for someone who is over weight? Yes, ab rollers have been around for a long time and are still a really great exercise. As far as someone who is overweight, they will definitely want to start slow and only roll out a little way at first. 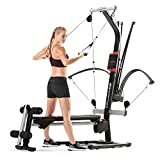 I would recommend the PERFECT FITNESS AB CARVER PRO. I own this one myself and I like the fact that it is really wide. This not only provides balance but also allows you to roll out to the right and left. Thank you so much for stopping by and leaving a comment!